What do population density, lightning, and the phone company have in common? File this one under “applications of population density”. 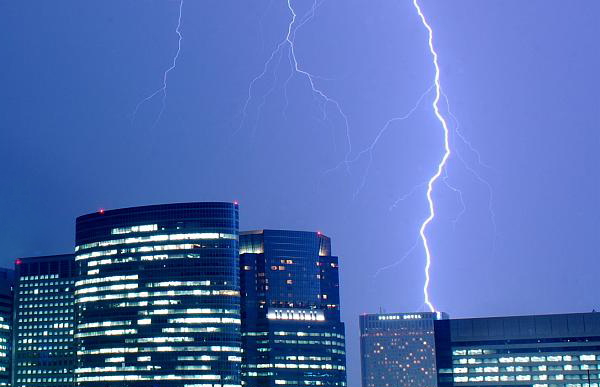 Researchers working for Nippon Telephone and Telegraph—better known as NTT—discovered they could use an area’s population density to predict telecommunications equipment failure due to lighting strikes. Telecommunications is an expensive business. Like other infrastructure, it requires a lot of manpower and capital to expand and maintain. But unlike many other systems, telecommunications—especially cellular network technology—has been advancing at a breakneck pace, requiring equipment to be upgraded or replaced every few years to stay current. Furthermore, the equipment is both delicate and expensive. Something like a lightning strike can easily cost tens to hundreds of thousands of dollars to repair. The NTT researchers were interested in predicting where lightning strikes would exact the most damage in coming years, especially since some climate models predict more severe weather, which can lead to more lightning. The study focused on three prefectures in Japan—Tokyo, Saitama, and Gunma—which represent a gradient of population density ranging from one of the most built-up urban environments to relatively sparse farmland. The prefectures also fall along a gradient of lightning intensity, with Gunma at the high end receiving 10 strikes per square kilometer and Tokyo at the low end receiving 3 strikes per square kilometer. Using past data on lightning strikes, telecom equipment failures due to lightning strikes, and the 2005 Japanese census, they developed a model to describe how telecom equipment failures due to lightning correlate with population density. At first blush, I expected urban areas to receive the brunt of the impact—after all, they have loads more equipment than rural areas—but the results were just the opposite. Expensive circuitry and antennas were safer in urban Tokyo than they were in rural Gunma, even when the discrepancy in lightning strikes between the two regions was taken into account. The authors offer two explanations for why telecom equipment is safer in urban areas. First, many of the copper lines that feed base stations and boxes run underground in cities, which lowers the induced voltage during a strike. Second, the equipment itself tends to be exposed to the elements in the country, either on the ground or perched atop telephone poles. In the city, most of it in encased in apartment buildings. But there is another possible explanation they missed—the design of telecom networks and their relationship to population density. The evidence lies in their calculated coefficient that describes how population density can predict equipment failures due to lightning strikes. The coefficient is ¾, and if you’ve been reading this blog for a while, you’ll no doubt recognize that number. As an exponent, ¾ is powerful descriptor, explaining a variety of phenomenon ranging from how plant sizes influences population density to how human population density affects the density of place names. In this case, ¾ seems to say less about the pattern of lightning strikes than it does about telecom network design and the differences between rural and urban infrastructure. Denser populations require more equipment, but not at a fixed rate. Cellular networks provide a good example. In rural areas, cell sizes are limited by area, not the number of users. It’s the opposite in the city—the more users, the smaller cells become. Therefore, phone companies can rely on fewer cells and less equipment per person in the city than in the country. The relationship between infrastructure demands and population density could go a long way to explaining why there is a lower rate of equipment failure in denser areas—there’s simply less equipment per person in the city than in the country. But the fact that telecom infrastructure—and damage to it—appears to scale at the same power that describes an range of phenomena related to density and metabolism, well, that’s just too good to be a coincidence.